Welcome to Derby Folk Weekender 2019! With this year presenting some challenges with venues and available space, we’ve had to look at a different offering. 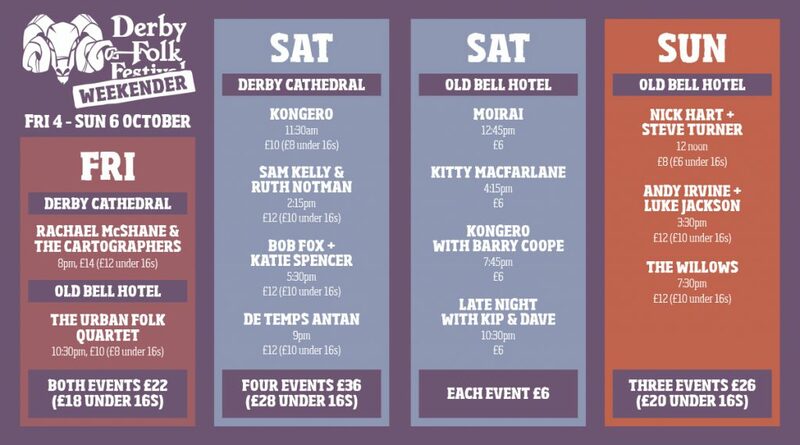 Whilst we can’t present the full festival that has grown over the years, we’ve put together what we think is a fantastic range of concerts; all as part of the Derby Folk Weekender. There are individual concerts in Derby Cathedral on Friday evening, and Saturday and concerts in The Old Bell Hotel on Friday evening, and through Saturday and Sunday. We’ll been updating Artist and Programme pages as we make announcements, so if you haven’t already done so, please keep checking back on the website to see what’s changed!